● Not much time to read books? ● Not much money to buy them? ● But lots of burdens that need answers? Then Hola, Happiness is for you. Best-selling author, Janet Perez Eckles presents a brief study of God’s Word to nudge you to the next level of triumph and joy. Hola, Happiness: Finding Joy by Dancing to the Melody of God’s Word is packed with soul-searching questions, deep reflections, brief videos and answers from God’s Word. No matter what you face–disappointment, fear, heartache, shame, insecurity, sorrow–you will say “Hola” to happiness, to the peace and the joy God created you for. Those who know the personal story of Janet Perez Eckles are aware that everything she writes comes from the heart. They also know that all her writings are suffused with an incredible joy that derives from her faith in God. 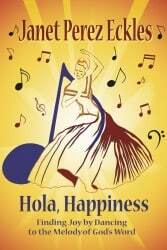 Her new book, Hola, Happiness, is no different. It is a collection of devotionals that resonate with joy and trust in the Lord. It is divided into four sections: Our Heart, Our Surroundings, Our Relationships, Our Future. These sections are subdivided into smaller segments for individual or group study. Each of these segments contains a link to an online video, with an introduction by Janet herself to the issues at hand. These videos were for me the highlight of the studies. People ask how as a blind person I can be so full of joy, says Janet on one of the videos. It is because I value the things that God gives me every day. If you are looking to find more joy in life – and who isn’t? – I strongly recommend this delightful book. After devouring, Hola, Happiness: Finding Joy by Dancing to the Melody of God’s Word, by Janet Perez Eckles, suddenly many of my life-questions had answers! Broken down into four easy-to-understand lessons, I like that it can be a reflective study either in private or in a group. Janet teaches us the necessary steps to a Paradise-bound salsa, while listening to the joyful musical of God’s Word. Hola Happiness is filled to overflowing with encouragement and hope for women of all ages. I love the format with a variety of learning styles. And Janet, as always, radiates so much joy throughout the pages. Each lesson has a video teaching, introduction, discussion/reflection questions, insight, scriptures and questions related to the scriptures. Session #1 is titled Our Heart and focuses on the topics of inadequacies, insecurities, adjustments, acceptance and shame. Session #2 is titled Our Surroundings and focuses on the topics of forgiveness, values, choices, disappointments and guidance. Session #3 is titled Our Relationships and focuses on the topics of motherhood, marriage, friends, trials and surrender. The Final Session #4 is titled Our Future. Both pithy and succulent, this Bible study relates to issues of life and afterlife in a high tech and emotionally relevant way. It is extremely well-organized. Each chapter should be savored. Each brief video of Janet is enlightening and encouraging. It is appropriate to use as a study for a group, and equally appropriate for an individual study. Janet’s warmth softens any fears inherent in self examination, and her ability to pull the right scripture to encourage the reader is phenomenal. I laughed but I cried too, as I was humbled by the love of God she reveals.